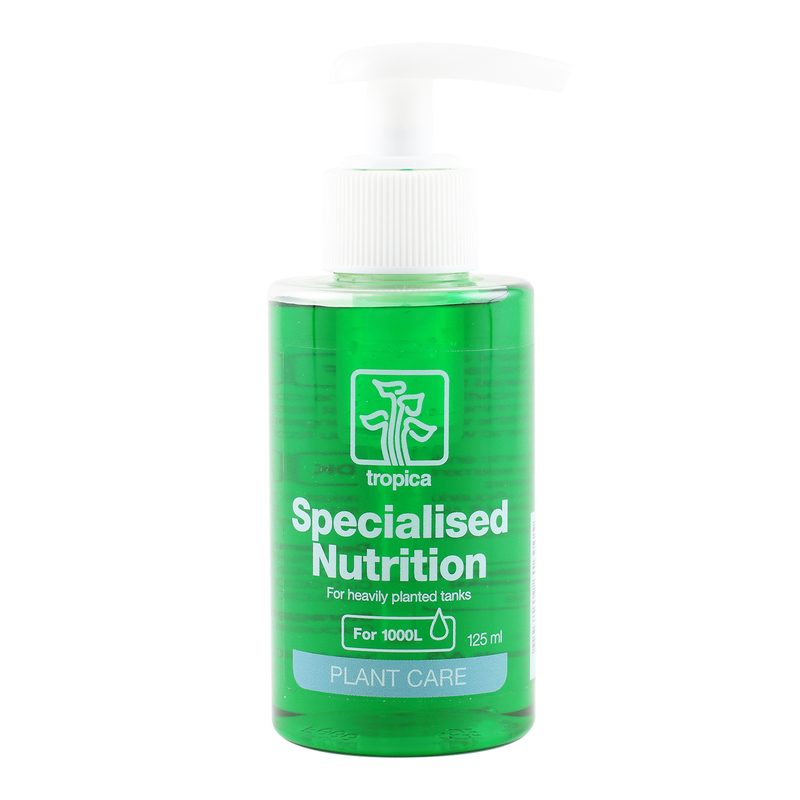 Here at Paratus Plants we use and recommend Tropica products and our own Green Plant range. 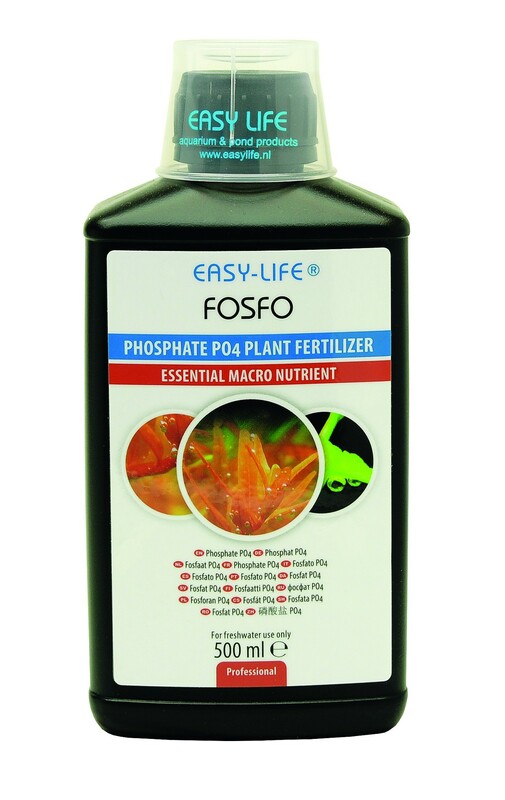 Like fish, plants need care and maintenance, which is why we have developed various fertiliser products that add the required nutrition. 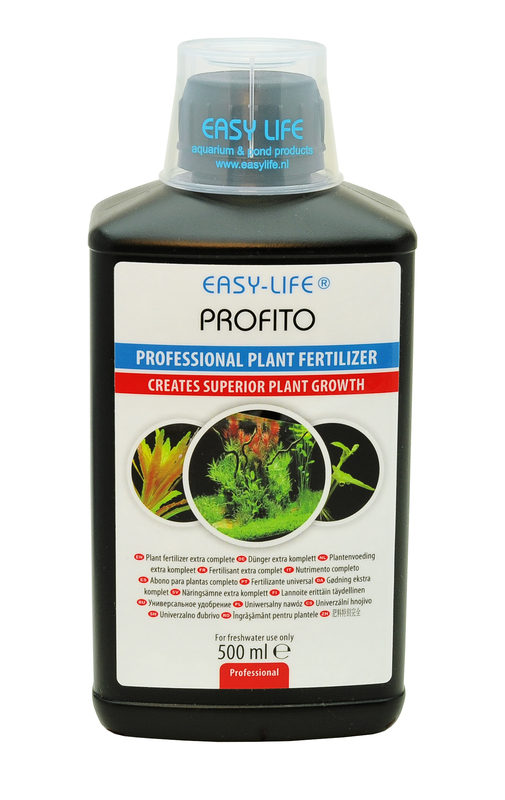 You can add CO2, nitrogen, phosphor, iron and micronutrients in different ways, and only fertilising will result in optimal growth and beautiful plant colours inside your aquarium. 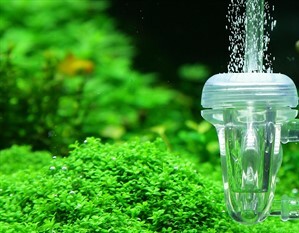 Aquarium plants require nutrients to grow. 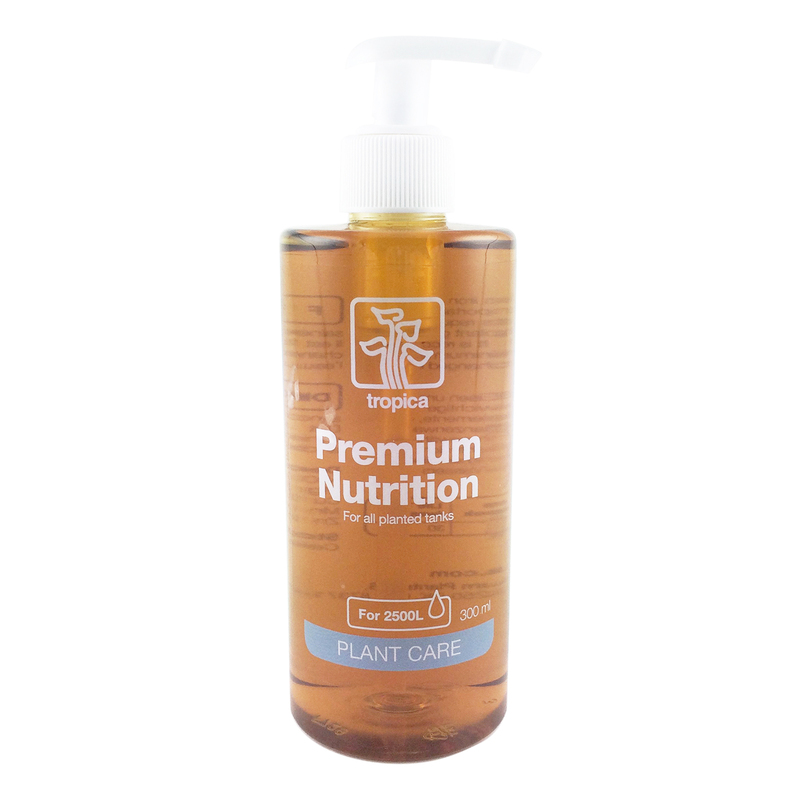 The main nutrient is CO2, which is also the main inhibitor of growth in the plant aquarium. If you don’t add extra CO2, plants have to do with what is naturally released by fish and bacteria inside the aquarium, which is inadequate for plants of the categories MEDIUM and ADVANCED. Other than CO2, plants also need nitrogen (N), phosphor (P), iron (Fe) and manganese (Mn). These substances are referred to as macronutrients, since the plants require relatively large amounts. 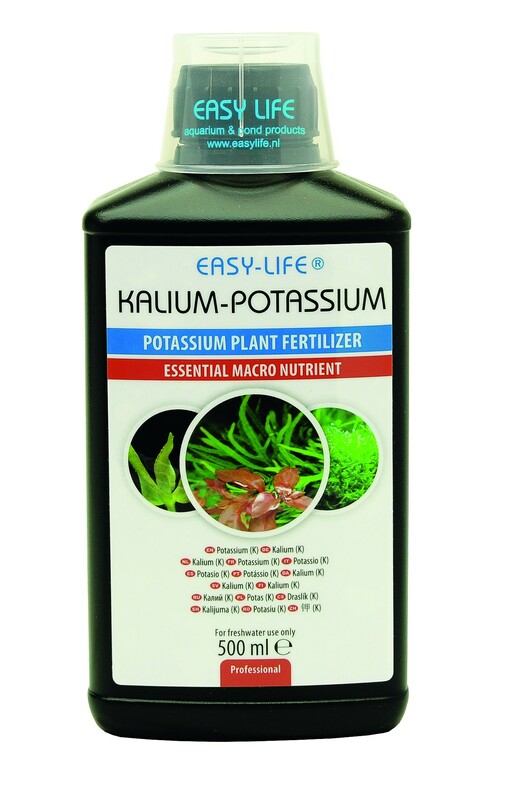 Aquarium plants can absorb all macronutrients both via roots and leaves, which is why the fertiliser can be added as fluent fertiliser to the water or as capsules to the substrate. 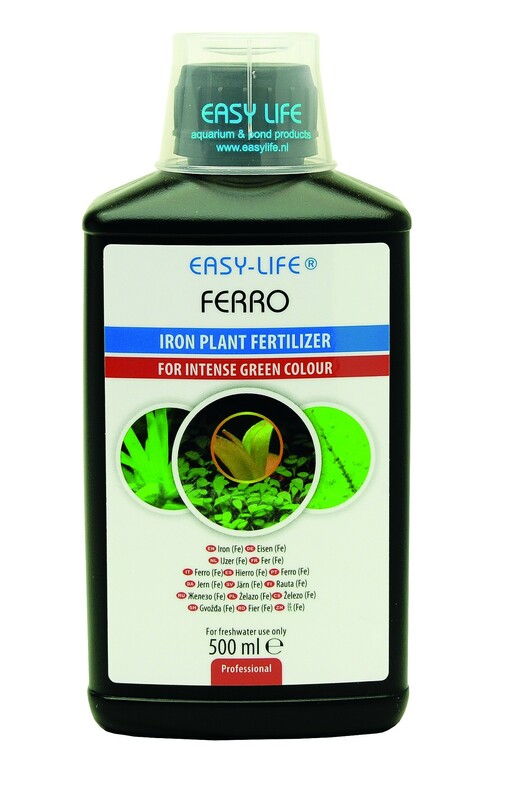 If you add fertiliser to the water, it requires frequent dosage (daily or weekly) and overfertilisation may result in algae problems, if the plants are unable to absorb the fertiliser as it is added. 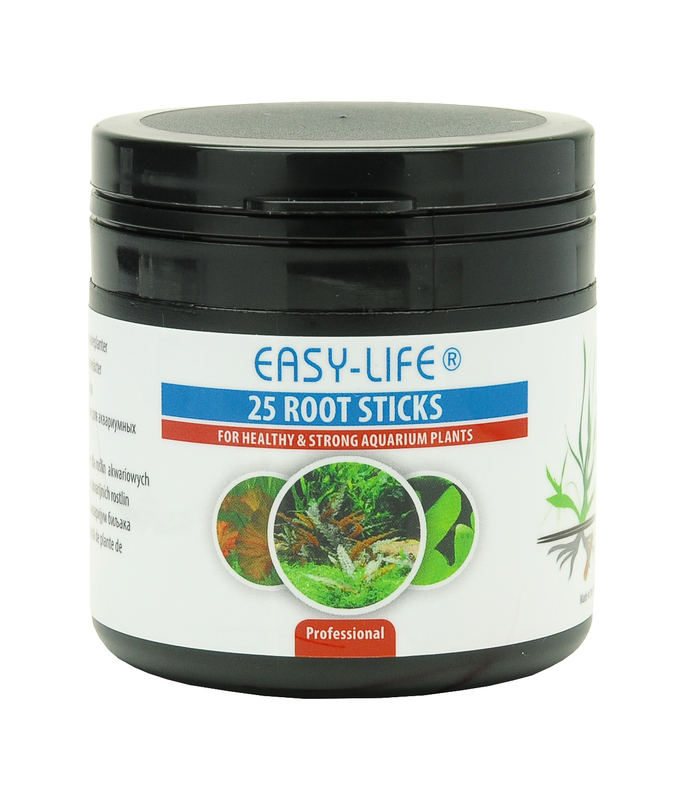 However, it is the only way to add fertiliser to e. g. moss, floating plants and plants on rocks and tree roots, since their roots aren’t located in the bottom layer. 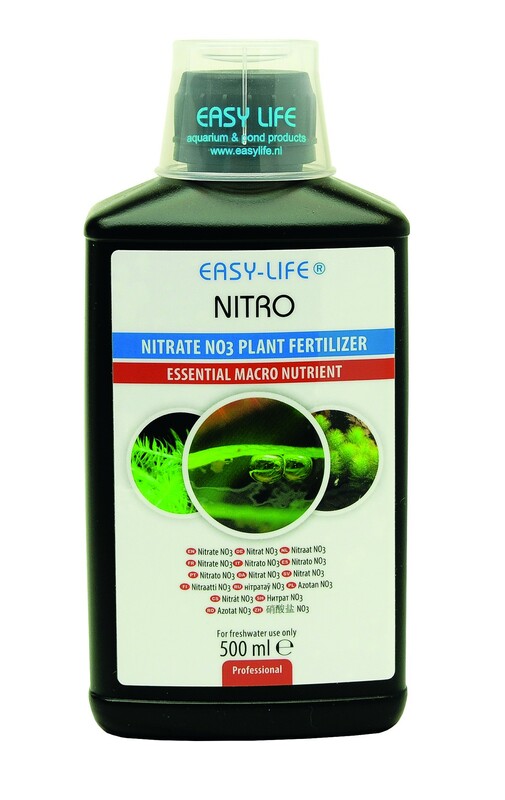 Nutrient capsules are ideal for large and sturdy plants or well-established carpets of front plants. 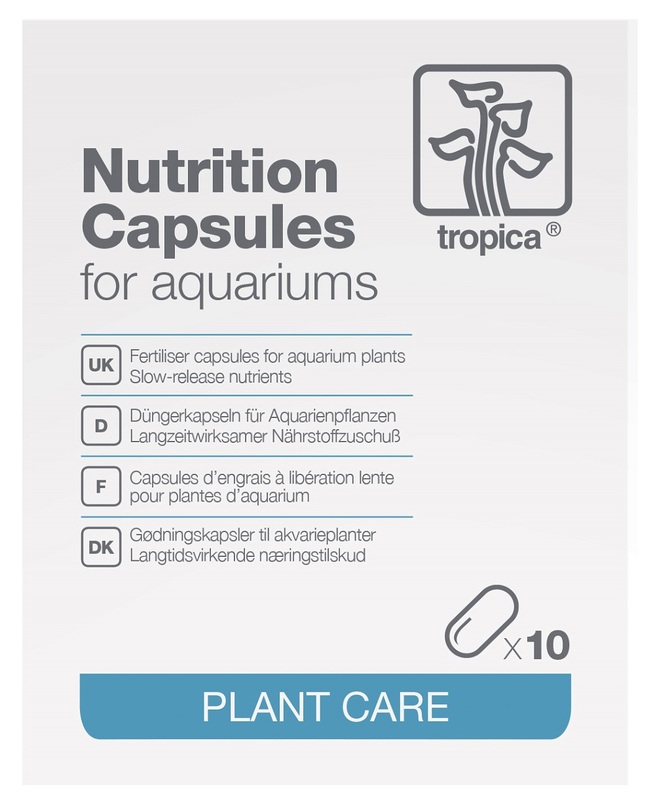 Tropica’s Nutrition Capsules release their nutrients over a period of 6-9 months. The third nutrient category is micronutrients such as copper, molybdenum, zinc and borate. These substances are part of vital enzymes, and when micronutrients are deficient, plants grow slower and start to show deficiency symptoms. 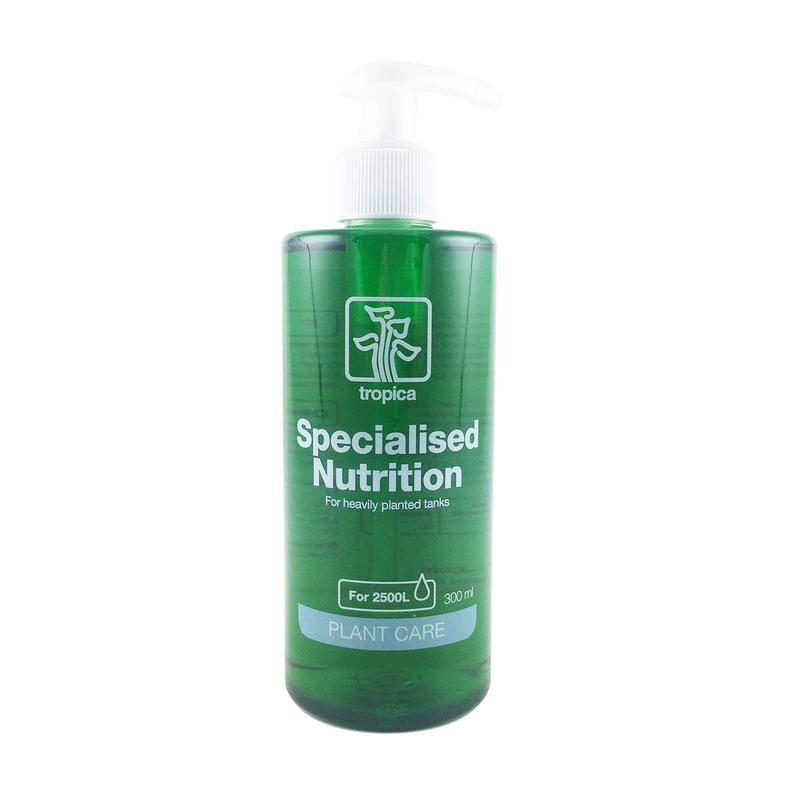 You can add micronutrients both in form of Premium and Specialised Fertiliser and as Nutrition Capsules. CO2 is the most important nutrient for the plants; without CO2 the plants are unable to perform a photosynthesis, which is the first step in a long range of processes that lead to growth..
How do I supply the CO2? You can supply the CO2 in several ways. Tropica recommends that you use compressed CO2 (see our systems here). Then you add the CO2 until you have reached the required pH in the table, and the required pH depends on the carbonate hardness of your water and on how much CO2 you wish to have in your aquarium. A bit of CO2 (e.g. 3-5 mg per L) is better than nothing. Plants that are marked "Medium" require about 10-15 mg CO2 per L, but "Advanced" plants require 15-30 mg CO2 per L.
What is CO2, dKh and pH? Do I need CO2? 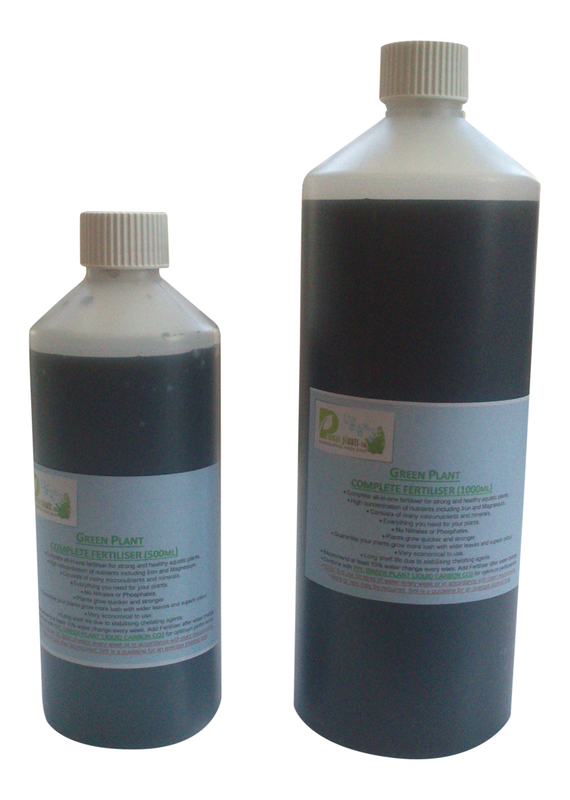 If you wish to have plants that are marked "Medium" or "Advanced" in your plant aquarium, you need to add CO2. 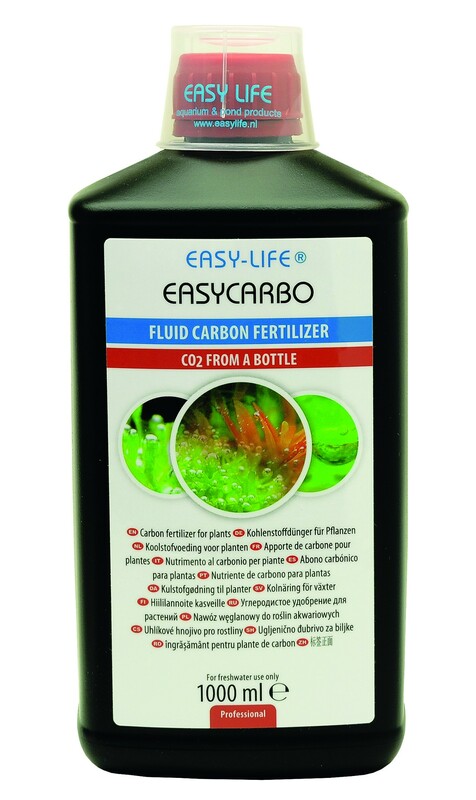 If you only have plants marked "Easy", you need not add extra CO2, but the plants will do better, if you choose to add just a bit. pH is a figure that expresses the acidity of the water. 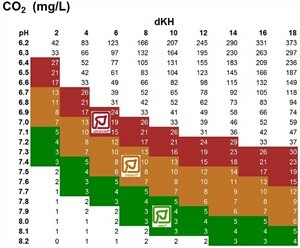 A low pH is acid, and a high pH is basic, while a neutral pH is defined as the area from 6 to 9 (the whole scale goes from 0-14). dKh is the carbonate hardness of the water and is expressed in German degrees of hardness (dKh). The carbonate hardness is the total amount of bicarbonate and carbonate. Determine the carbonate hardness of the water before you start (typically by means of a drip set). Determine the required CO2 level (orange is e.g. 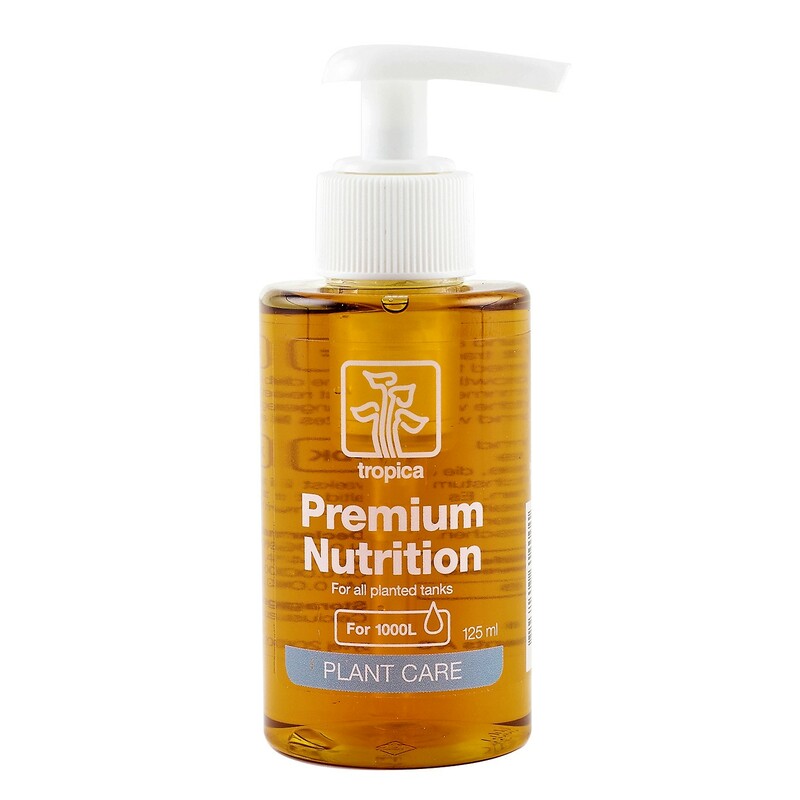 Tropicas recommended CO2 concentration for Medium plant categori; 6-15 mg CO2 per L). If your water has a carbonate hardness of e.g. 12 dKh, the CO2 supply must be adjusted until the pH value is at 7,5 to 7,8. What is the relationship between CO2, pH and dKh? The relationship is partly illustrated in the figure to the right. By a low pH, the bicarbonate (HCO3) and carbonate (CO3) are converted into CO2. By a neutral pH, most of it is converted into HCO3, while CO3 dominates by a high pH. 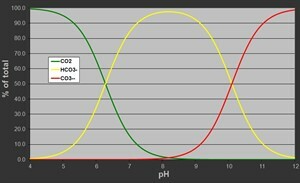 So by adjusting the pH value, you can control the amount of CO2 in your aquarium.